I recently had to take a step back from all the skincare samples I was testing out and the various changes I was constantly making to my routine, in order to give my skin a little break. I'm usually quite lucky in the sense that my skin will rarely react oddly or get irritated, but a couple of weeks ago, it clearly decided enough was enough. So I took it back to basics, kept my routine super simple with a few products that I had been eyeing up for quite some time and now my skin is in a much better place. 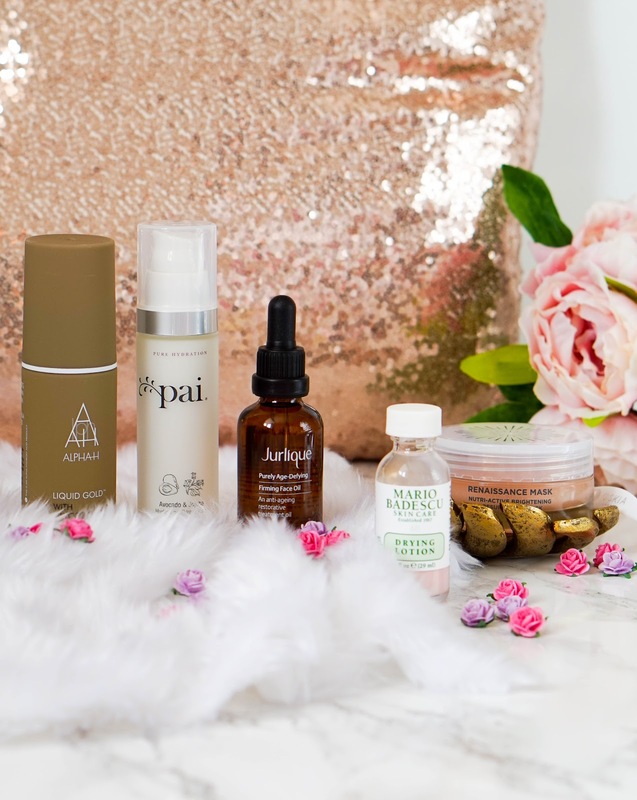 Of course I'm still trying out new products for the blog from time to time, with newbies from The Ordinary and Pixi being the most recent... but I make sure to introduce one product at a time and give my skin little breaks in between. Just FIY for anyone that is new to my blog, my skin tends to be on the dry side of things, not overly so but enough to make sure I am always including hydrating products in my routine. Now enough small talk, let me tell you all about the few products that brought my skin back to normality. 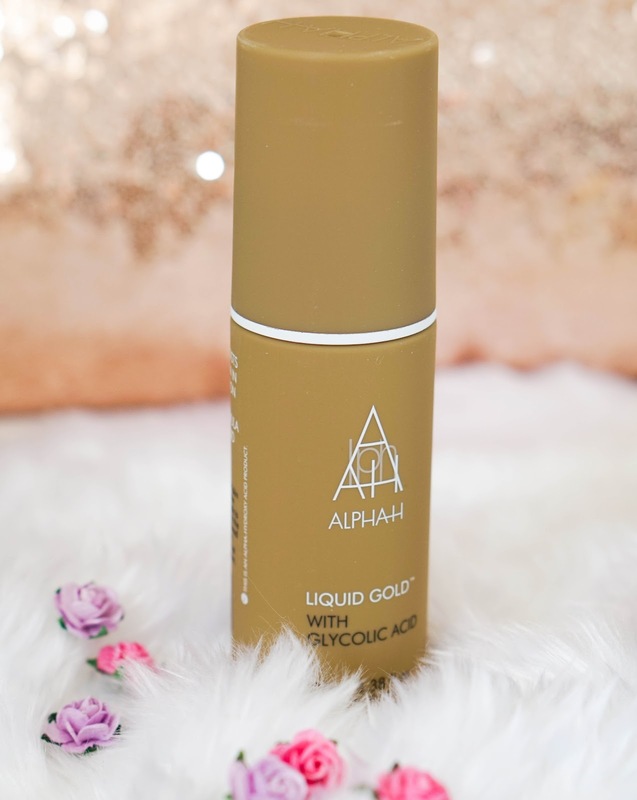 First up I've got Alpha H Liquid Gold, which is a powerful resurfacing treatment enriched with silk proteins, licorice extract and Glycolic Acid. Straight away this product is not recommended for sensitive skin, so stay away if your skin gets easily irritated. I actually had the opportunity to sample this with my Marks & Spencer Beauty Advents Calendar back in December and knew I would want to get my hands on it after the first couple of uses. The glycolic acid content is quite high at 5% so it's not recommended as a daily treatment. I personally use it between 2 to 3 times a week and apply with a cotton pad at night only to avoid causing major sun burn (PS do expect a tingling sensation, it's perfectly normal). It's basically an overnight treatment that exfoliates dead skin cells, revealing healthy skin underneath. It also stimulates cellular activity, which essentially helps to repair and renew the skin. I quickly realised that it's one of those products you begin to miss as soon as you stop using it, so I am really happy to have it back in my routine. It helps to keep my skin's texture smooth and super soft. Along with other chemical exfoliators, I have given up on using grainy products to exfoliate and my skin is much happier this way. This treatment is also loved for its anti-ageing and skin-brightening benefits, which I can never clarify when it comes to my own skin as I don't really have wrinkles yet and don't suffer with sun damage either. However it is great at keeping my skin feeling refreshed, tightening my pores and adding radiance. Next up I have the organic British brand, Pai Skincare of course. I recently finished up my bottle of their Rosehip Oil, which I loved and wanted to try more. So when I spotted the brand's Avocado & Jojoba Hydrating Day Cream on Beauty Bay with great 5 star reviews, I knew I had to have it and I'm so glad I picked it up. I use this on it's own as my morning moisturiser and my skin is really happy. This moisturiser is aimed at dry, dehydrated & sensitive skin, since it provides long-lasting hydration and leaves skin calm. Two pumps is all I need to instantly plump my skin and smooth out any dry patches I may have. It has a light, buttery texture that doesn't feel greasy at all and literally melts into my skin, ready for makeup application within minutes. Since it is summer and my skin is not as dry as usual, I don't need to use a serum with this.. although I have been experimenting with The Ordinary Hyaluronic Acid an/off and still not sure how I feel overall (but that's for another post). The cream is enriched with organic Avocado and Jojoba oils that are high in Vitamins A, D, & E. It also contains Omegas 3 & 6, which nourish and deeply condition the skin. I almost forgot to mention that I love the packaging... considering this is quite affordable at £32, I'm happy that it comes in a frosted glass bottle and has a hygienic pump too. Next I have a facial oil from a brand that I have only experienced on a few rare occasions but have always loved. 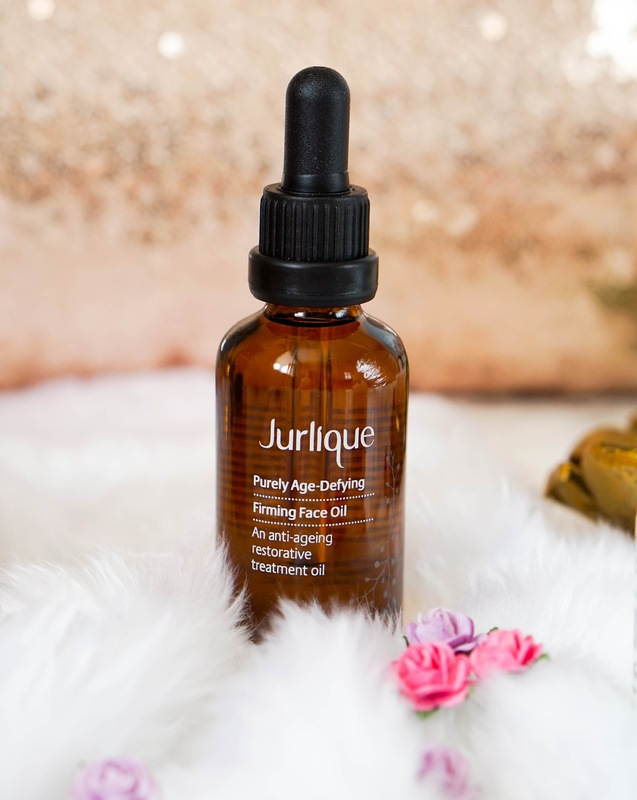 I'm talking about the Jurlique Purely Age-Defying Firming Face Oil, which has been specifically designed as a treatment to smooth wrinkles and even out the skin tone. Whilst I'm not dealing with wrinkles just yet (as I mentioned above), I do like to know I am preventing them to the best of my ability hence why I am trying to introduce some anti-ageing products in my routine. This oil contains a powerful blend of blackcurrant seed oil, buriti oil and rock samphire extract... which help to replenish skin tone, support collagen production and combat visible signs of ageing. I love how soft and luminous my skin feels the next day, once it's been absorbed overnight. It's made with 100% natural and essential oils, that are free from parabens, preservatives and artificial colours. I typically apply 4/5 drops using my fingertips to gently press onto the face. (I like to use a bit more than the recommended 2/3 drops). It has a light herbal fragrance, but I don't find it overpowering or nauseating and it's nicely packaged in a dark glass bottle with a dropper. Even though it's a nourishing oil, it feels quite lightweight and can also be used during the day if needed. I've actually used it a couple of times when wanting to wear foundation that might cause dry patches. I really like that it helps to tone and firm my skin, whilst keeping it nourished and adding radiance. I don't have anything negative to report. I recently ran out of my trusty Origins Spot Remover (you can read about here if you don't know what I'm talking about) and decided to try another spot product that I have seen being raved about in the blogosphere. 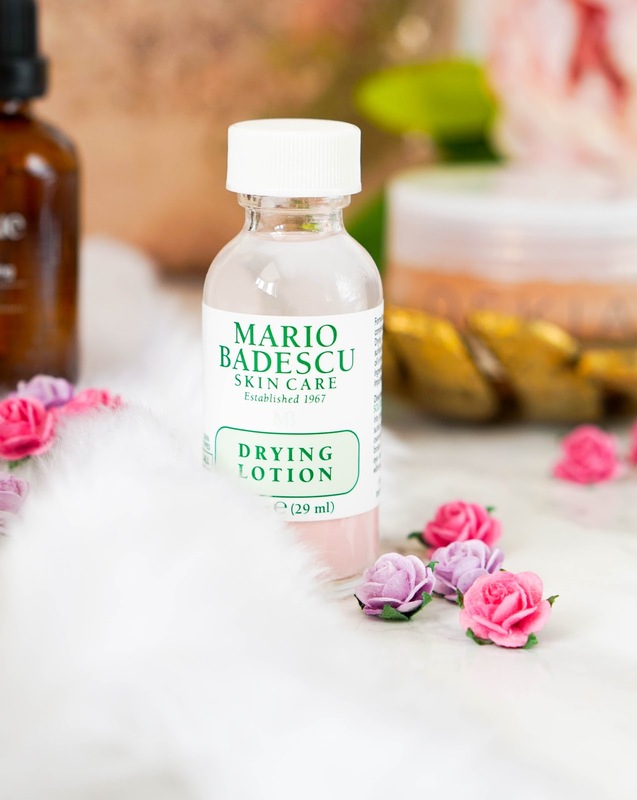 I picked up the Mario Badescu Drying Lotion hoping it will rival my favourite Origins product, but I'm not so sure that it has (I'm still in two minds over it). This spot treatment is made with a blend of Calamine and Salicylic Acid, which help to clear up and soothes blemishes almost overnight. The formula is separated into 2 parts; the top section which is a clear liquid containing alcohol and the bottom pink section which has calamine as its main ingredient. Other ingredients include sulphur, zinc oxide, titanium dioxide and salicylic acid, which all help towards drying out blemishes. The instructions are quite clear, you must NOT shake the bottle, not matter how badly you may want to mix up the two parts. You are supposed to use a a cotton bud to gently dip through the clear portion until you reach the pink mixture at the bottom. Make sure the cotton bud is covered with the pink mixture and then dab this on individual blemishes. It will dry up on the skin within seconds leaving a chalky finish behind. I can't confirm how this might work as an acne treatment, because I only use it for the odd breakouts... but I can however say that this works really well and does what it says on the tin (it effectively dries out spots). So why am I not so keen?! Well firstly it has a strong medicated scent which isn't that pleasant to use. The scent is mostly from the alcohol, which is the second point I am a bit concerned with as shouldn't alcohol be on your 'avoid' list when it comes to skincare?! Thirdly I'm not liking all the faffing about with a cotton bud, it looses its excitement after a couple of uses. Not to mention that I'm not a fan of not being able to use this during the day (unless I want to walk around with pink spots on my skin). With the Origins Spot treatment having a clear formula, I would use it during the day if needed but this isn't really possible with the Mario Badescu option. Don't get me wrong I will use it all up eventually as it does work, but not too sure I will repurchase in the future. 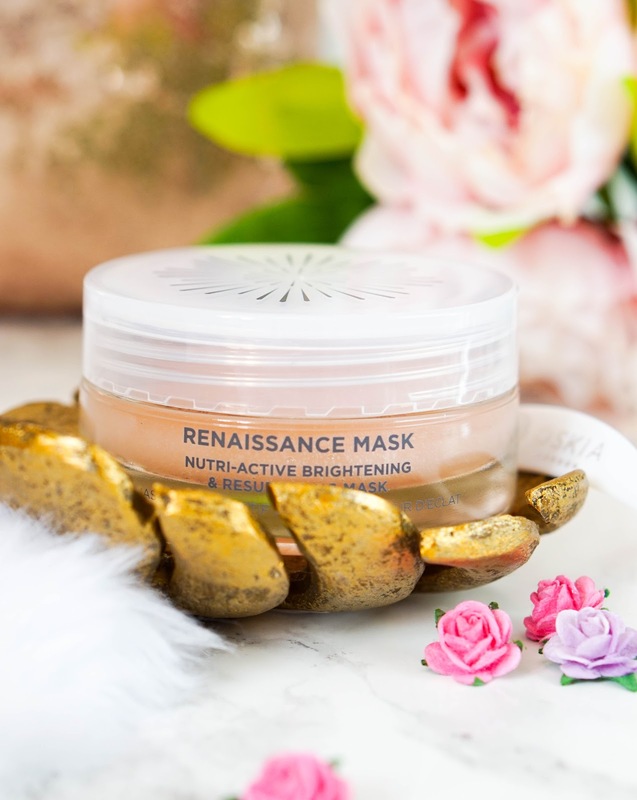 Lastly I've got the Oskia Renaissance Mask, which is one of my most luxurious face masks but definitely worth every penny. I have been eyeing up this mask for far too long and was hooked even more when my friend gave me a decent sample to try out. It's by far one of the best face masks I've tried out and something I will continue to repurchase (sadly for my bank account because it ain't cheap). Oskia are well known as an award winning, British, luxury skincare brand. 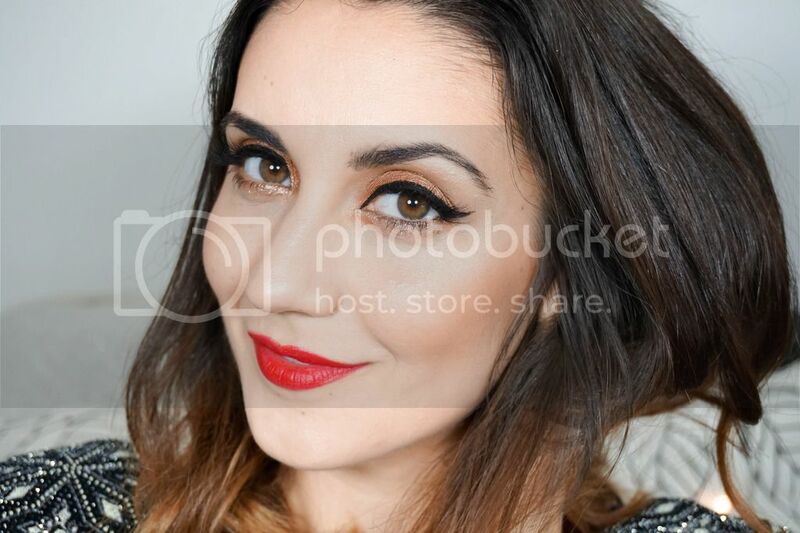 They focus on incorporating MSM often called the 'Beauty Mineral' into their formulas. These MSM enriched products have highly effective and anti-ageing properties. The actual mask is packed in a super luxe and weighty glass jar (not great for traveling I'm afraid, but you could always depot a small amount needed for a trip away). This buttery balm is designed to increase cell turnover, boost radiance and gradually reduce the appearance of fine lines. It contains natural fruit acids such as grape, lemon & grapefruit AHA's as well as papaya enzymes to exfoliate dull skin cells and unblock pores. It also includes lactic acid to stimulates cell regeneration along with probiotics to help fight bacteria. The trick with this mask is to massage it into the skin until it turns from peach to white, which is how you know the ingredients have been activated. You are supposed to leave it on for up to 15 minutes before rinsing off and make sure to only use it twice a week (as much as I love it I wouldn't use it more than that anyway due to its high price tag). There's a light sweet floral scent which is lovely in my opinion and really adds to the whole relaxing facial experience. My skin looks brighter and more revitalised instantly, so of course I am hooked. It does an excellent job at clearing and tightening my pores, as well as leaving my skin silky soft and radiant. So as you can see I've discovered a bunch of new skincare products that are doing wonders for my skin at the moment and I couldn't be happier. Have you tried any of the above brands or products? Let me know if you have in the comments below..